Following up from yesterday's report of the first hands-on impressions of the new AT&T Pre Plus, the device's release date has been reported courtesy of an anonymous tipster to Engadget. 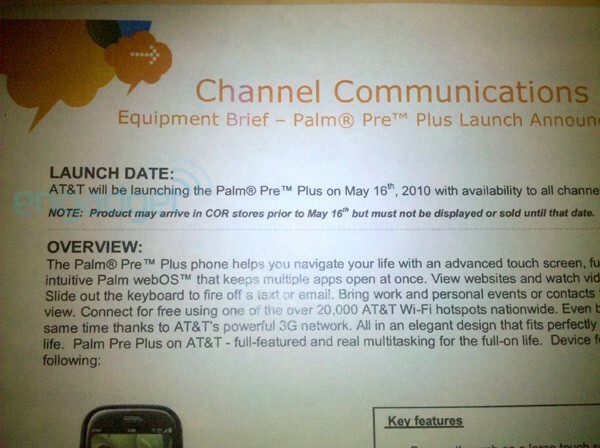 GSM WebOS fans will finally get the opportunity to officially purchase a Pre Plus starting May 16th. In addition to the release date, a few additional details have been confirmed. First of all, the free mobile hotspot feature currently being offered by Verizon Wireless is nowhere to be found on the AT&T Pre Plus. As a small concession, however, the devices will let users hop onto AT&T's nationwide wi-fi hotspot locations at no additional charge. Interestingly enough, neither the Engadget article nor the leaked AT&T document indicate that the Pixi Plus will be available alongside its more powerful sibling. It is not clear at this time if the devices will be released around the same time. The announced pricing for the AT&T Palm Pre Plus and Palm Pixi Plus is $149.99 and $49.99, respectively, with a two-year service agreement and after a $100 mail-in rebate. Why did I not think of this? It should have been obvious that ATT would cripple that b/c of their wimpy 3G network, albeit ''nations fastest'', ha. Hey, besides Ryan, am I going to be the only person on PIC using a webOS device? No, you will be the 2nd after Darth Republican. He has a Sprint Pre. And Timmmay has a German QWERTZ unlocked GSM Pre that's in worse shape than he is after boot camp. Other than that, in all seriousness, I cannot name a PIC 'regular' that owns a WebOS device! Gekko bailed on PIC & Palm OS + his Centro. He's getting a Sprint HTC Evo 4G when it comes out next month. Not that I'm a regular by any means, but I got a Sprint Palm Pre too! Decided to go with 'smart phones' again after the city I live in finally got EVDO from Sprint over this past winter. Had the 755p last year before going down to a 'music' phone, then went to a Blackberry 8330 (and lost it) and now the Pre after 'enjoying' EVDO again. Gonna actually try Palm OS now, but on the Nokia N800 via Garnet VM! ---> Never mind that, just using the 755p instead. When will PDAs and smartphones communicate with other devices to let you know when they are out of site? It would be helpful to know so they do not get lost. This could be done with Bluetooth. If the device falls to the ground the a set distance away from another device the device alert you with an audible sound. Is the content of more value than the device? In my neighborhood, the unit won't have to communicate that it's out of touch with the AT&T network. It will always be a brick. It says right in the picture above that the Pre connects "for free to any of over 20,000 AT&T Wi-Fi Hotspots nationwide". The AT&T page from the previous article specifically lists the same information. I'm on AT&T and they integrate the WiFi hot spots into the wireless connectivity. You sign in and you get free WiFi. I don't know how the Pre works necessarily, but on my iPhone, the switch from 3G to WiFi is automatic. I signed in once to the AT&T WiFi Hot Spot service and anytime I'm near one it automatically switches. Full Disclosure: I am an AT&T employee. And yes, I'm considering switching from my iPhone to the Pre. Haven't decided yet, but I am thinking about it. Maybe I am misinterpreting your comment but I think we need some clarification here. By "hotspot", I/we/the article suggest using the Palm device as a wireless access point. Example: You take your Pre Plus, turn on "hotspot" mode (ie access point/ connection sharing/Mi-Fi/tethering/router mode) and you connect to the internet via the Pre utilizing your laptop/netbook/iPad/PDA's wi-fi connection. This is usually otherwise done via a hardwired connection or via apps such as June Fabrics' PDAnet for jainbroken iPhones/WinMob/Android/Garnet. Verizon normally charges $15 for this feature but is now bundling it at no additional charge for their WebOS phones. Sprint does not offer this feature on their version of the Pre. So, in summary, we are not talking about the 3G to wifi switchover or the 802.11g capabilites of the Pre. We are talking about sharing your Pre's internet connection with other devices via wi-fi! Sorry again if I am not clear on your comment but I think we are talking about two entirely separate things. Just wanted to clarify it! Ditto Khris. I should have clarified the term "hotspot". I meant the Pre as a WiFi host via 3G, not a WiFi user. Although, I am jazzed @ ATT hotspots. I've ran into them in several places with my netbook to no avail. I guess it's going to be off to the hombrew community quick for the hotspot... thanks once again ATT. Well at least they are keeping their word and bringing the thing, crippled or not. The thinking is having Pixi communicate with a Pre to notify if any one of the two is a certain distance from each other. They would be working together to keep from getting lost. Pat Horne volunteers for SUICIDE MISSION!!! Bless you, my son. A greater reward awaits you in heaven. Fear not the pain that you are about to experience - your sacrifice for us all is a noble one. Vaya con Dios. Thanks for the clarification. Yes, it appears we are talking about two different things. Given that AT&T hasn't even turned on tethering on the iPhone yet, I couldn't hazard a guess as to if, let alone when, they might add any access point functionality to their phones. Guess I haven't stayed as close to the webOS stuff as I would have liked. You haven't missed much. In fact, you've missed being a paying beta tester (ala LifeDrive, Treo 650 & 700p, Tungsten T5). NOW it's worth starting to pay attention to WebOS, what with some real $ and energy being thrown at this pig! Palm & Verizon in their move of desperation may have quietly kicked one of the sleeper "must have" features of 2010. I've honestly heard of more people buying VZW WebOS devices lately just because they are cheaper and offer more functionality than a mi-fi and have "free" tethering. Just spoke with someone today @ that Just throw the free Pixi in the attic plugged in and use it for hotspot sake alone. $30/mos. How's they manage that??? VZW mandates that all smartphones carry at least the basic voice plan + mandaatory unlimited data + email "personal" plan. So you're looking at a minimum of $40 + $30 / month for an individual plan or $100+/month on a family plan split between 2 lines. VZW let you use the old grandfathered smartphones (the Centro is VZ's most recent smartphone you can activate w/o a data plan or as data only without voice). A mobile modem what an innovative thought. Two is a team, one is very quiet though thoughtful. Reverend - so you want to pay $30/month+ to use the Pre/Pixi as a slow 3G hotspot for your house when you can get a much faster and cheaper more reliable uncapped cable broadband with with wifi router? Does the i represents innovation? Not all people understand innovation. If people did not choose to innovative and put their thoughts at risk of ridicule we would have fewer choices. Some innovate and some critique thoughts and innovation. There is room for all kinds of people it makes the planet and PIC forum a lively vibrant place. If we all thoughts the same we would have very little new to talk about or do. Human interaction requires advanced interaction such as the Internet to bring people together. Unfortunately some people do not value innovation that is their choice. Some people are looking to a future of less plastic and more metal in their hardware that is a choice too. One region can not manufacture everything if we want more choices. It seems the capability of the manufacturer is dictating what can be built. Some thoughts do not fit with the current manufacturing trends. What to do? Who decides what to build the manufacturer or the people that choose to purchase from the manufacturer? Does the individual benefit when the manufacturers are manufacturing similar products with similar comparabilities or does the individual? How does one differentiate ones idea from others when the manufacturers can not build new concepts such as we-com virtual wallets. There still is not a display that can read ones finger print. The R&D to develop new innovation is not free or cheap. Do we wait for the manufacturer to catch up or do we start something new that can work with existing infrastructure? What do you think drives innovation? Is it the manufacturer? Is it people and their thoughts? Is it a combination of the two? Can manufactures catch up or keep up with our changing planet? Is it logical to have manufacturing facilities in region where the ideas/thoughts incubate? Does North America still have manufacturing facilities that can keep up with our North American innovative economy? Why do we off shore so much of our manufacturing? Do such decisions assure more choices are developed or is it for a price point? Are we excluding markets by manufacturing off shore? Do we affect our innovative capital flow by having to wait for manufacturers to catch up? Was manufacturing the reason the Jetsons still had analog currency or an over site? North America and our trade partners are well ahead of the manufacturing curve and things seem to be bottle necking. Do we need more high tech manufacturing facilities that can keep up with the will of the people and the demand of a we-com economy? Just some more thoughts to expand upon. Would you want Pixi and Pre to communicate with each other to assure your content is never lost? Could this be done with Bluetooth? Would such choices assure ones content is never lost? Could GPS be used to locate ones device if further away than 10 meters/30 feet? Have you ever lost your content? Is your content priceless? Is more than one device needed for this type of service? Some of these thoughts were developed for a we-com virtual wallet, however, they can be shared with others too. Ones wallet contains content that people do not want to lose. Enabling ones we-com virtual wallet to communicate with a PDA or smartphone will assure it is never lost. Please share your thoughts on the future too. Well it is good not to forget the i. Perhaps as some have said before i is needed for accountability and we is needed for progress. innovation is fun and more people should have fun. Innovations is a good use of ones freedom. The Jetsons did not have we-com virtual wallet technology we can. As we move into the future the Jetsons is a great example of what can happen when we leave thoughts behind or do not develop thoughts.